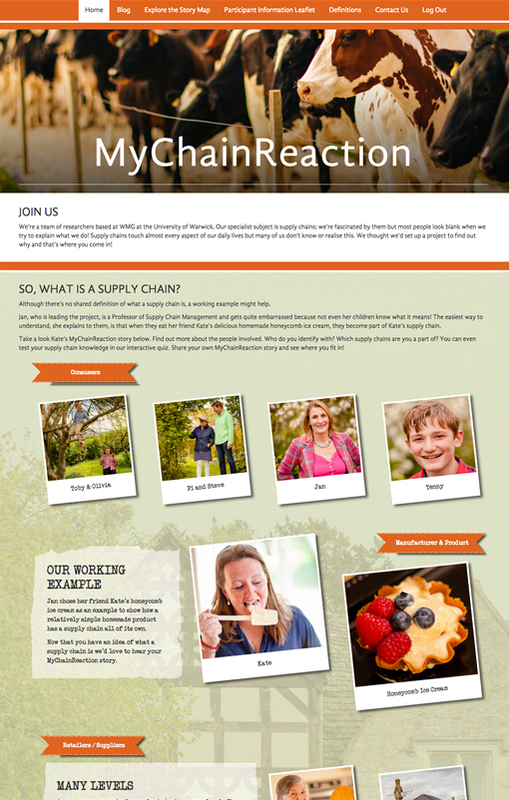 Mychainreaction is a website built for WMG (Warwick Manufacturing Group) at the University of Warwick. This Warwick web design is purpose built for a study in to supply chains. The website uses the University or Warwick web design colours, highlighting an example supply chain to help visitors understand the purpose of the website. The front page is designed as an infographic tiled wall to show users the supply chain of a local honeycomb ice cream supplier. Each tile contains hover over information or buttons that quiz and inform users about the supply chain of the product. This process guides the user to a button for them to add their supply chain story. Once users have added their story via an online form, it is added to an mosaic wall of stories from other visitors, as well as videos and images. Users can then browse through those stories. This Warwick web design also includes geo-location of the user stories, showing where each submission was posted from and the number of users. Website users can then hone in on the map in certain areas and see what people have written. This makes it possible to browse the map and see how far across the globe the website has reached, as well as making the website more interactive and interesting to use. The Warwick web design also has a built in blog which shares the style of the other archive pages on the site to keep the look and feel of the site uniform. Here the administrators are able to share their own interesting stories about the supply chain. This website is completely bespoke, using plugins to enhance the functionality. The main coding uses the Bootstrap framework, geolocation via GeoMyWp and user post creation with Gravity Forms. All images used on the website were taken by the creative team involved in the project, and really make a difference.